Upon Seeing Himself in a Mirror © 2014 Bernadette E. Kazmarski, may not be reproduced in any way without express written permission of the author. Links to this blog are fine. My poetry has won several awards of excellence or Muse medallions in the Cat Writers Association contest: “Pawprints and Raindrops”, The Gift of a Morning, and Once. Read about the awards here. 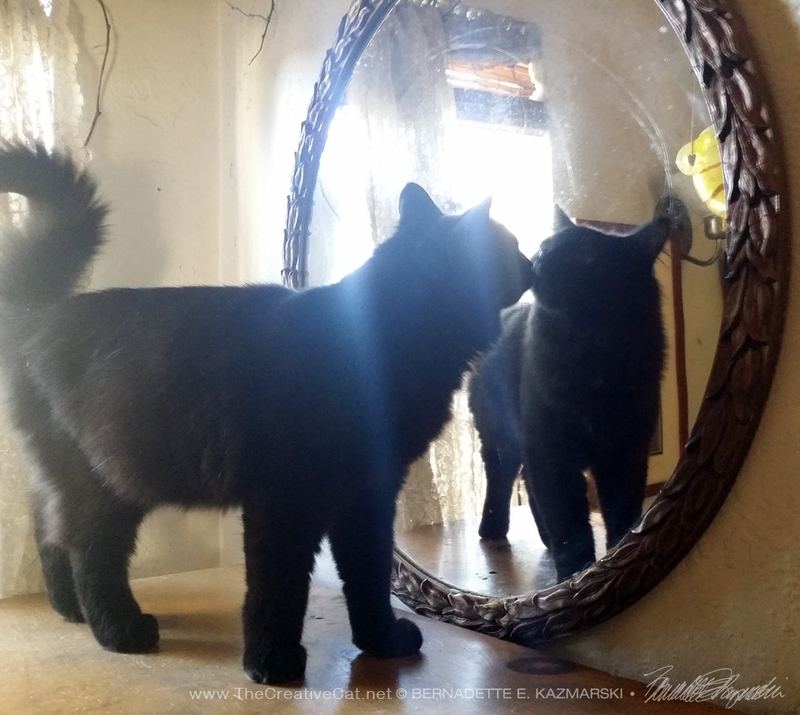 I wrote this poem in early November 2014 when Basil, then named Smokie, was about six months old and still easily surprised and intimidated by unexpected things, like a kitty he didn’t know, even if the kitty was his own reflection in a mirror. I saw the moment coming and had the chance to photograph this encounter, and I was very moved that instead of acting aggressively, which was not his style, or running away, as would be expected from a kitten who’d suffered some unknown trauma and nearly been euthanized because he totally failed his temperament test, even after fostering, he reached out to the unknown kitten with an act of friendship. Yes, love can change these things, and it saves lives. Smokie had just discovered a few new places, and one of them was the top of the wardrobe where so many cats have sat to watch the day and nap. It has a great view down the steps and into both upstairs rooms, and right next to the bathroom door a kitty can just look around the door frame to see what’s happening in there. 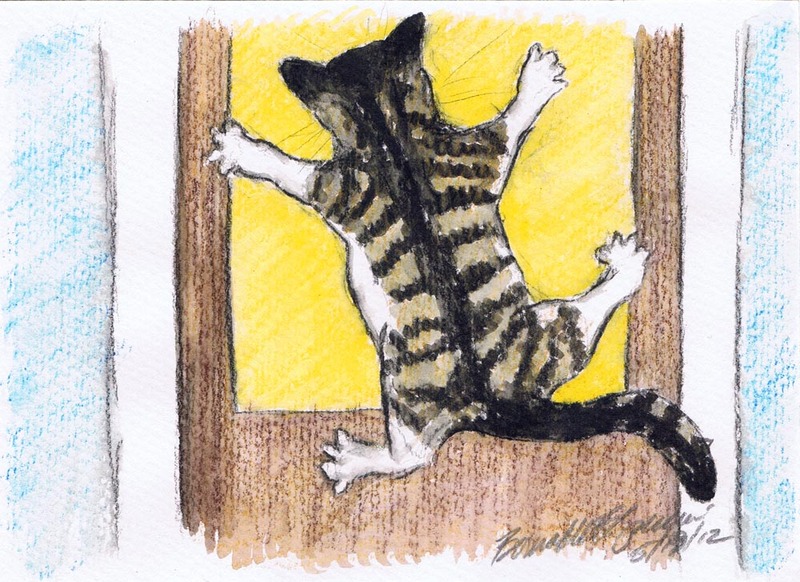 It’s a favorite place, but not all that easy to get to unless a ninja shows you how to stand there, jump up onto the windowsill, carefully turn around and leap straight up onto the top of the wardrobe, where Smokie encountered…himself, or at least, another cat. He has seen himself in the bathroom mirror, but in this case he was confronted by a whole cat, not just a face that disappeared when he drew back. He can still be easily frightened, and stood kind of frozen for a second or two, then tentatively reached out to tap the unknown kitty’s nose, his first gesture one of friendship, just as it was when Bella came to live here. He’s gotten used to himself now, and totally owns the top of that wardrobe. It’s been fulfilling to watch him change and grow. One night not so long ago a young and slender black cat quickly and silently trotted down the sidewalk of the neighborhood where he lived, a long and graceful shadow against the moonlit snow, disappearing completely into the shadows of shrubs and cars and doorsteps when he needed to stop for respite from the wind. The night was cold, cold, just plain cold as that straight and icy wind surged down the street like a ghostly wave, straight off the frozen river, enveloping him in a blanket that penetrated his fur as his paws crunched on the snow. Reaching a familiar front door he leapt past it onto a windowsill and eagerly looked inside, to see only darkness. As usual his new person wasn’t home and there was no way for him to get inside to where there was at least warmth, if not also some food, unless the young man had forgotten that again too. He didn’t mind living on mice if he at least had a warm and safe place to sleep for a while each day, but he hadn’t found the young man home at all for days. He leaped down from the windowsill back to the snowy sidewalk. Out of the cover of the sill the sudden blast of a circling gust of wind at his back lifted his fur and filled between each hair with cold so deep he thought he’d freeze in place. Trotting quickly he reached the end of an alley at the corner of the house and quickly turned into the shadow, breaking into a little canter without the wind buffeting him about, hurrying to reach the steps that led up to the deck on the second floor of the house. Little lights were twined on the railing all the way up the steps and on the railing around the deck, and even a few around the windows. This cheered him for the occupants who had once lived here had always had these lights—perhaps they were back! 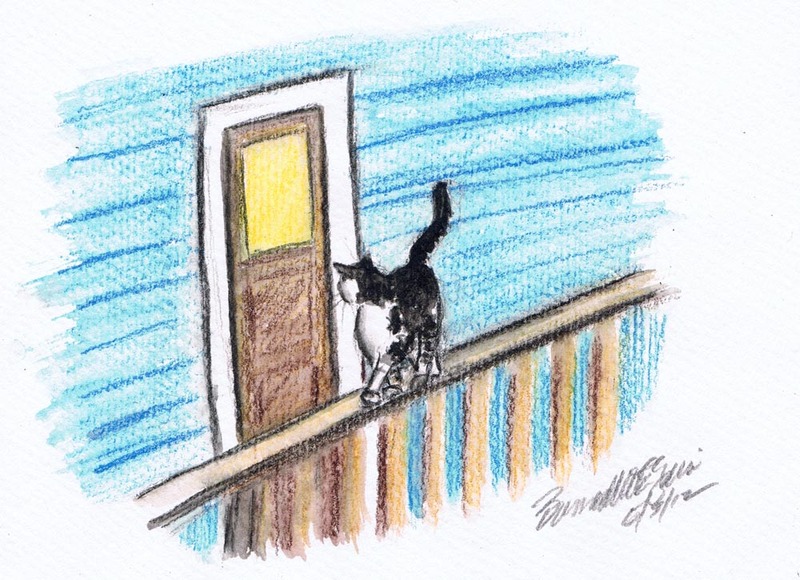 The rail around the deck was covered in snow and ice and he had often stepped onto it easily, balancing along it with his tail high in the air to look into other windows and the door, hoping to be noticed by the people who lived there. Yellow light streamed from the windows and he hopped lightly onto the sill of the one that looked into the room where the humans ate but a curtain was drawn across, and though he could see shapes moving behind it and hear voices inside, he could not see anything clearly, and they could not see him at all. He knew the former occupants were not in there. These humans kept the windows covered and had never answered to his meows though he had announced himself loudly in his high-pitched sing-song greeting. They never seemed to notice him at all. It wasn’t these people with the little dogs that he wanted anyway. He hoped to catch sight of the large black cat who had lived there and the kind woman who lived with her, the woman who had kept a bowl just for him inside the door in that eating room with the bright yellow light, who would let him in no matter when he appeared at the window, tapping his paws, or stood up and drummed at the door, and would fill that bowl to the brim with tasty crunchies. Both she and the black cat would watch him eat but make no move to tell him to leave, and he would stay for a while after his meal, bathing and giving into his drowsiness in the quiet warmth of the room before awakening, washing his face and asking at the door to leave. He might have stayed but he knew the room and all the other rooms around it belonged to that black lady cat who watched him quietly with her green eyes, who seemed to understand his hunger and his need for these few moments of companionship, though she made it clear without a word or a move that all this was indeed hers, and the human was hers too. He didn’t mind her rules about how long he could stay or what was hers. That she let him in at all was a great honor and he would never overstep his bounds and risk going without these few brief moments of security. But she no longer lived in this place at the top of the long steps, nor her person, and the little lights had disappeared long ago. The young man on the first floor to whom the woman had entrusted him just before she disappeared had been fun at first, kind of like one of his unneutered feline buddies, but the guy was home less and less, and sometimes he was home but didn’t answer the meows and tapping at the door and window. And he never had crunchies for the cat, much less food for himself. In desperation, the young cat left the heights of the deck. After a pause at the end of the dark alley he plunged into the wind booming down the street, squinting his eyes and folding back his ears against his head as he turned toward one more place, the place where he’d lived before he started wandering, wandering because those humans had not let him in but had wanted him to stay outdoors around the house to catch the vermin they attracted with their garbage. There wasn’t much hope he’d find any warmth or food or pets there, but he had to keep moving or he himself would freeze in this frozen city. The night had been growing quite dark as the moon was covered by clouds moving quickly across the sky, and as he hurried down the sidewalk on slender legs blurred by the motion of his rapid trot on freezing paws he began to hear the click of hard icy pellets hitting the snow and shrubs and houses and cars all around him, and speckling the delicate skin of his ears like little bee stings, and landing on his fur. The windows of that house were dark anyway, as were most along this street, though many had those little lights outside that were still shining brightly. He had found they were actually a little warm if you got close to them but decided that would not be enough to keep him warm. He ducked under the front porch, shook himself from head to tail then arched his back and fluffed out his fur for extra insulation. Tucking himself into a familiar protected spot he lowered himself to the ground, curling all four paws underneath his belly and wrapping his long tail around himself to seal in the warmth and try to thaw his toes. After a few shuffles so that all his paws and legs were comfortable, he tucked his chin into the fur of his chest, and in the shadows he looked like a slightly misshapen fuzzy black ball with ears. He had no idea what he would do without food or water, or a warm place to sleep on this frigid night. He was exhausted and unwilling to step out into the now thickly falling snow to look…where? What else was there out there that he could possibly eat? Everything was frozen, even in the garbage cans, which he had tried earlier, before the darkness fell. He closed his eyes, gathered all his warmth together and lightly dozed to give himself a break from the cold and hunger. He felt a familiar feline presence approaching. He had no idea how much time had passed, looking at how much snow had piled around the covering of the porch. Another larger and older black cat entered underneath and quietly crouched a short distance away. It was his friend, Wiccan, a wise and ageless neutered male who had always been a mentor to all the cats on the street, and especially to the slender and wandering young black cat. His presence itself was a comfort. After a brief and companionable silence while they both closed their eyes and tucked their chins to sense the emotional space the other was inhabiting, Wiccan turned his face in the other cat’s direction, slightly opening his eyes and blinking a consoling message. Young Pumpkin, you could come to our house. You cannot come in, but my human would give you food and a box to sleep in. It is better than freezing to death in this deep and frozen night. Because you know you will. Pumpkin waited a moment before answering, turning his head lightly in the direction of Wiccan. I would take your kindness and be glad for the food and the box, but I don’t want just food and a box anymore, he said, not opening his eyes. I want a home, enough to be willing to die for it. I am tired of wandering, and if this night is my last then that is how it was meant to be. He paused, then continued with a sentiment he wasn’t even certain he’d intended to share. I want to find the ladycat Mlle. Daisy and her human. I know we found them once after they disappeared from the top of the steps inside those windows, you took me there. He turned and tucked his nose into the fur of his narrow chest, breathing his own warmth back into himself, his energy for the moment spent. Pumpkin, you know they would have taken you in at any time if you had stayed there. Pumpkin flicked and swiveled his ears, not lifting his nose from his chest. I wasn’t ready. I was still responsible to another human, insufficient as they were, and they had not released me to join a new family. Wiccan knew this was true. He also knew a cat had to make his own move sometimes and break the ties with the life that no longer suited him or was literally killing him, especially if he had found the home that was right for him. Pumpkin was a good, honest and gentle cat, deserving of a home and humans who would respect and return his love and loyalty. It was why Wiccan had once led Pumpkin around the corner to the noisy and dangerous street and to the front door of the limestone building where he’d seen the woman entering and leaving, and Mlle. Daisy in her dignified repose in the bay window, watching the street through narrowed green eyes. But Pumpkin was right, he had not been ready, he was still tied to the family that had taken him in as a kitten, and a loyal cat like Pumpkin did not break his ties easily or without the clarity of a mutual decision. Wiccan tucked his chin. The stillness under the porch within the ethereal whisper of the swirling and falling snow outside had fashioned a dreamlike, timeless space. He swiveled his ears and searched this night for an answer. Wiccan knew what it would be before he even found it; the nudge of this vision on his consciousness was the reason he’d left the warmth of his home to come to find Pumpkin before the emaciated young cat really did freeze to death in some spot where he’d taken shelter. Though he was weakening from the months of deprivation, Pumpkin’s will and life force were strong. But Wiccan had seen a frozen Canadian night full of howling wind and falling snow take down many a strong-willed being, feline and otherwise. Wiccan took seriously his responsibility to all the felines on this street, and he knew he needed to help Pumpkin through this transition or he would die. In this quiet, concentrated space, he followed the vision as it unfolded. He saw the new place, Mlle. Daisy curled in her red brocade bed, where the woman now lived with Mlle. Daisy, and with a man who had visited before they moved from the place at the top of the stairs where Pumpkin had just visited, hoping to find them. Wiccan could see they were inside the windows at the very top of the building, in the back, and each window had a gentle beckoning light like a beacon, a point to focus on to find one’s way. It was so strong and clear he felt Pumpkin could see some of these details along with him, in that way that cats share ideas. So strong, in fact, that Wiccan suddenly stood up and arched his back and shook himself from head to tail, feeling a certain urgency. He walked over to Pumpkin and gently burrowed his nose in the fur behind Pumpkin’s ear and snuffled, a dominant cat’s gentler indication that he would be followed. Wiccan then turned and walked out from under the porch into the falling snow, leaving fresh tracks in the deepening snow on the sidewalk, knowing the young cat would join him. Pumpkin got up and without the warming stretch and head shake simply followed Wiccan, following faith in the one being in his world who he knew cared for him, and the little flashes of Wiccan’s visions he’d perceived through the accumulating fog in his being. They faded into the falling snow, buffeted by gusts, two shadows in one path, then disappeared, their pawprints filling with new snow almost as soon as they had passed. They neared the end of the street but did not turn onto the new street. Instead they crossed to the opposite sidewalk just before the corner and entered the back yard of the house at the end. Suddenly in the lee of the buildings the sudden lack of wind actually made the air seem warmer and all was quiet, the wind and street sounds muffled. They crossed that yard and another in a straight line, ducking under the hedges as they passed from one yard to the next. When they reached the third yard Wiccan turned toward the shadows and headed for the set of steps at the back of the building. It was much as Pumpkin had seen in Wiccan’s thoughts, the long, long steps taking turns and angles on their way up, the snow swirling lazily down as the wind swept it over the building then dropped it to fall gently into the darkness behind. That darkness was broken only by two tiny bright lights toward which they were now headed, Wiccan leading the way through the deepening snow, up and up and up the steps. Pumpkin followed, unsure what would happen, but feeling a surge of warmth and energy, the inner fog dispelling. When they reached the top he vaguely sensed the scent of the woman and Mlle. Daisy. Wiccan walked directly over to the window on the right, and leaped up onto the windowsill, knocking snow down as he settled himself to look inside. Leaping up on the sill to face Wiccan, Pumpkin also settled himself onto the snow. They could see inside, and though the light in the window was the only light in this room there were clearly lights on inside the rest of the rooms. Wiccan looked at him and Pumpkin felt Wiccan was waiting for him to do something, though still weak, hungry and cold he could not grasp an idea. When he only sat looking at Wiccan, Wiccan turned and looked inside, raised a paw and tapped on the window. Mlle. Daisy appeared first, the glow of the light reflecting on her eyes and shining warmly on her fur as she entered the darkened room. Then two dark human shapes filled the doorway one after the other and both came to the window. He recognized them both and sat up once again, looking into both of their eyes in turn, drumming his paws on the window, trying not to hope, but hoping all the same. Together, the two humans reached down and slowly lifted the sash, and warm air flowed out through the opening, carrying with it the familiar scents of Mlle. Daisy and the woman and the man and all their things inside this wonderful warm and quiet space. They continued lifting the window until the sash was nearly at its top, and leaned down to look at both cats sitting on the sill. Pumpkin looked at her for a long moment, then turned to look at Wiccan. What should I do? Should I ask? No. They are expecting you. Step inside, and meet your destiny. Pumpkin stood up and lifted a paw over the drift of snow on the sill, delicately stepping on the wooden sill inside, one front paw and then the other. He was halfway in and halfway out. He turned and looked at Wiccan, then brought both hind paws onto the sill inside. Pumpkin turned to look at Wiccan once more and blinked. Wiccan blinked in return. It was done. “Well, come in wee Pumpkin,” both humans said encouragingly as Mlle. Daisy circled around behind them, out of reach of the chilling wind and falling snow blowing in the open window. “Little Pumpkin you are freezing!” the woman said as she picked him up in a warm and loving embrace. For all the times he had visited her he had not encouraged her to pick him up; he was completely unused to it as no one had ever really held him with love and affection. He began to shiver as he shared the warmth of her body, and then to purr deeply, giving in to the love. “Does Wiccan want to come in as well?” they asked. Wiccan looked at them and blinked, took one more look at Pumpkin cuddling in his human’s arms, turned around and jumped down from the sill, walking across to the steps, already visualizing the fireplace in his own home just a short distance away. Behind him the window closed and the humans disappeared, carrying the young cat with them. Briefly Mlle. Daisy appeared at the window next to the light, met his eyes and blinked once as he turned for a last look, then she too was gone from the window. He made his way carefully down the long flight of steps, his night’s mission complete. 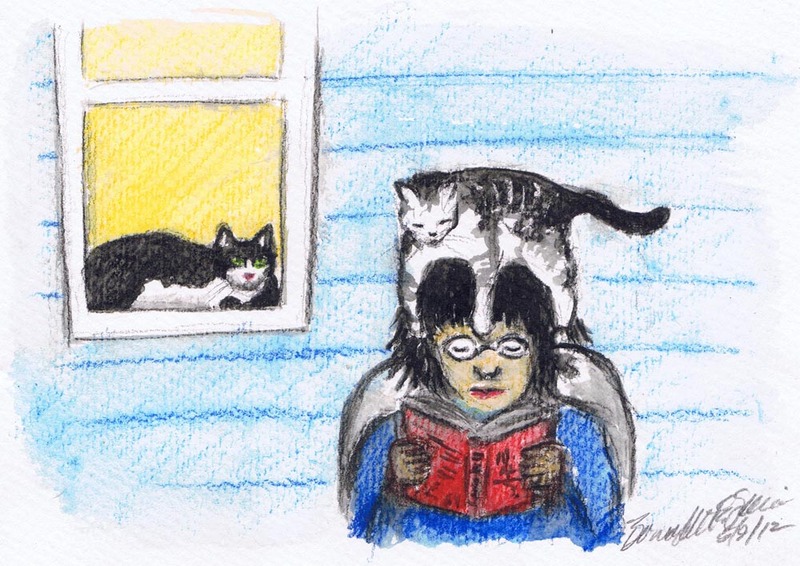 Though dramatized, the basis of this story is true, and it involves cats and people I’ve written about on The Creative Cat. Wee Pumpkin, who really had been adopted to kill mice really did visit Mlle. Daisy and her human where they lived in Kingston, Ontario, tapping and then drumming on the window and door to announce his arrival, and was fed his fill from vintage glass dishes as nice as those from which Mlle. Daisy nibbled her morsels. Though his name was Yogurt, he was often referred to by dairy derivatives of that such as Brie and Cream Cheese, by Giuseppe who was concerned when the young cat would visit the apartment and his love Mlle. Daisy with Giuseppe himself so far away. Now and then Wiccan showed up at the window too. The young man downstairs had offered to care for Pumpkin when the lady and Mlle. Daisy moved around the corner, but really did not follow through. On Christmas Eve 2012, the woman and man, who had moved to a larger place just around the corner initially to the first floor then to the third floor of the limestone building, did hear tapping on the window at the back of their apartment and found Wiccan and Pumpkin looking in. They opened the window and Pumpkin walked inside, but Wiccan turned and left. Pumpkin lived with them happily ever after with two more moves to new places, adoring his humans and always respectful of the loving and dignified Mlle. Daisy. He was named Theophile for the artist Theophile Steinlen because the slender and angular Theo looked like one of the angular black cats in Steinlen’s illustrations. 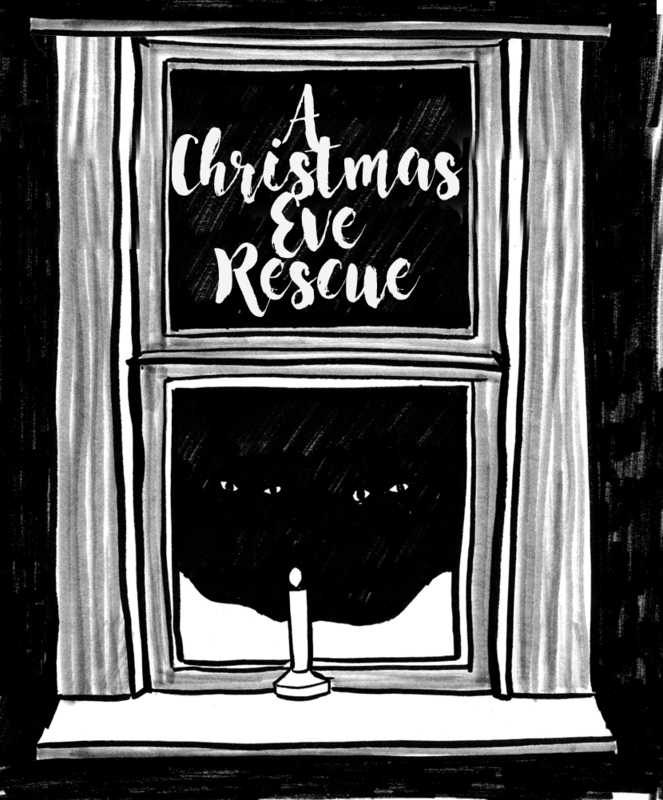 The story stayed with me, and I wanted to celebrate the wonderful rescue and homecoming of a loyal and loving cat on the anniversary of the event, and wrote this story in 2013 with one sketchy illustration, above. I was so happy for Pumpkin, now Theo, in his rescue from near death on the streets, but I also remember that his experience represents thousands of cats every day in all seasons who are abandoned and living in between, trying to support themselves in a hostile world with no support when they’d really rather live with a human. We can do better by the animals we as humans have domesticated and welcomed into our lives. Learn their signs, and welcome them in. Demand that people care for them and not abandon them. Sadly, Theo died in his sleep in August 2016. I received a message from his person that he just hadn’t awakened from his nap and all signs pointed to an underlying cardiac issue. Nothing could describe the sadness of the loss of a cat who really was as gentle, compassionate and sensitive as he seemed to be. At least he had a few years of a very comfortable life, completely loved. And he will never be forgotten. I plan to expand the story to its natural length and include a set of illustrations done as linoleum block prints. 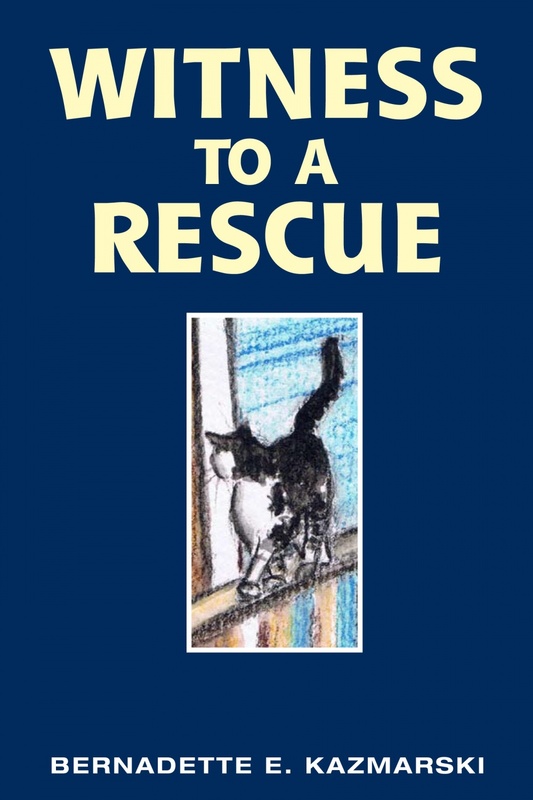 I would self-produce and self-publish this book, and sell books and prints for the benefit of rescued cats, both those I rescue personally and other cats through donations to rescues and other individuals. You can help me with this by donating toward it or by supporting me through my Patreon page. See information below.